The suitable pickup is as important as first-rate instrument. You will acquire background knowledge about principle of the most used pickup systems on this page. These information wil help you to select the best system for your instrument we hope. Single coils - pickups with one coil only. Single coils produces very authentic guitar sound with briliant trebles, however it is noisy. Partial solution is additional coil. This coil is not undepreciated coil-called parasitic coil. Parasitic coil helps reduce the noise and hum only and it hasn´t influence on pickup output. The sound is cleaner but it isn´t genuine single coil pickups sound. There are less of trebles and more of basses without acoustic authenticity. The typical single coil pickup is for example Gibson P 90 and its version with parasitic coil is P 100. Humbuckers - are two connected single coil pickups in fact. Humbucker has more powerful sound with full basses and mids. Trebles are mellower. Two coils eliminates hum and noise, but the sound is not as acoustic authentically as the single coil sound is. Most of humbucker wirings makes it possible to use only one of coils. It works like single coil pickups with parasitic coil. Typical jazz humbuckers: Gibson ´57, Gibson 490, Seymour Duncan SH 2. Floating pickups - can be single coil or humbucker. Floating pickups are fixed at the end of guitar neck or in pickguard without holes in top plate. Floating pickups are mostly suited for jazz guitars only. Floatings are smaller than standard pickups with lesser output, respecting acoustic characteristics of the guitar. Typical floatings: De Armond, Kent Armstrong, Bartolini. Piezo pickups - there are two variants of piezo systems-for acoustic guitars (in wooden bridge) and for electric guitars (in metal bridge-mostly tune-o-matic). Wooden bridges - Fishman Archtop, Schatten, ... There are two piezo elements under bridge wheels. This system produces acoustic sound. It is suitable for full acoustic or historic jazz guitars. 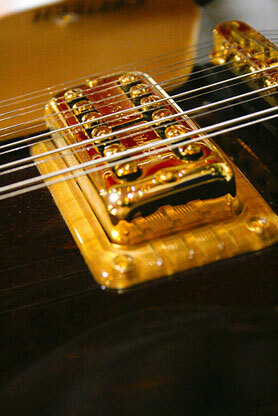 Metal bridges - the same system is used for electric guitar. There is one piezo element under each saddle. Prochazka Custom Guitars recommend L.R.Baggs and R.M.C. products. You can use mixed signal from standard 6,3 mm mono output plug or each signal separately via MIDI output plug. (you can effect each string separately for example). More information about accessories and about usage of this system like MIDI pickup you can find at R.M.C. http://www.rmcpickup.com. There is a possibility to combine magnetic and piezo pickups. The active mix is necessary. Prochazka Custom Guitars recommend SBS active electronics. Piezo pickups: There are two types of pickups - transducers - contact pickups placed on top plate or on bridge leg and under saddle pickups - placed in bridge channel under saddle. Transducers convert top plate vibrations into an electric signal. The sound is very acoustic. The quality of sound depends above all on acoustic quality of instruments above all. This system is useless for poor quality guitars. Under saddle pickups convert string vibrations from saddle rather than vibrations of top plate. The sound is more powerful but not so authentic. The application of preamps or preamps with EQ is recommended for both of systems. However EQ accentuates main drawbacks of piezo pickups. Preamp without active corrections is more suitable for acoustic instruments. Prochazka Custom Guitars recommend piezo systems: Fishman and L.R.Baggs - Hex Serie. Capacity pickups: Capacity pickups are a new generation pickups supplanting piezo pickups. The principle is assumed from condenser microphones. There are two types of capacity pickups as well as piezo pickups - transducers and under saddle pickups. The sound is authentic, less dynamic with a full range of frequencies. The usage of this type of pickup is the same as piezo pickup usage. Prochazka Custom Guitars recommend L.R.Baggs and Shadow - Nanoflex line. Single coils produces very authentic guitar sound with briliant trebles, however it is noisy. Partial solution is an additional coil. This coil is not undepreciated coil-called parasitic coil. Parasitic coil helps reduce the noise and hum only and it hasn´t influence on pickup output. The sound is cleaner but it isn´t the genuine single coil pickups sound. There are less of trebles and more of basses without acoustic authenticity. Two coils eliminate hum and noise, but the sound is not as acoustic authentically as the single coil sound is. Most of humbucker wirings make it possible to use only one of the coils. It works like single coil pickups with parasitic coil. Acoustic guitar magnetic pickups are located in sound hole or they are mounted at the end of fingerboard. The new generation of magnetic pickups cooperates with acoustic guitar strings without E1 and H string unbalance. The special type of magnetic pickup is active pickup - pickup with active preamp inside. This version requires battery. Prochazka Custom Guitars recommend L.R.Baggs - M1 or M1 Active and Shadow Nanomag. Microphones: Microphones produce the most acoustic sound. The problem is predisposition to feedback. Prochazka Custom Guitars recommend L.R.Baggs, Fishman and GHS inside guitar microphones. Single coils produces very authentic guitar sound with briliant trebles, however it is noisy. Partial solution is additional coil. This coil is not undepreciated coil-called parasitic coil. Parasitic coil helps reduce the noise and hum only and it hasn´t influence on pickup output. The sound is cleaner but it isn´t genuine single coil pickups sound. There are less of trebles and more of basses without acoustic authenticity. Two coils eliminates hum and noise, but the sound is not as acoustic authentically as the single coil sound is. Most of humbucker wirings makes it possible to use only one of coils. It acted like single coil pickups with parasitic coil. The sound is brilliant with powerful output. Very suitable for using with effects or processor. However active pickups doesn´t respect guitar characteristics at the expense of its sound. Piezo pickups: The system is located in the bridge. There is one piezo element under each saddle. Optical pickups: Very rare and modern pickup system. There is one optical element for each string ahead of bridge. The system uses string oscilating above optical element to produce electrical signal. The sound is briliant and absolutely clean. However optical pickup doesn´t respect guitar characteristics at the expense of its sound. Active electronics: There are two elementary variants of active electronics - preamps an preamps with equalizer (usually 2 or 3 bands). Special type of active electronic is a preamp with 1 band EQ - usually modulated mid range (Mid Boost). Active electronics is mostly used with magnetic pickups but cooperate with other types of pickups too. Active electronic requires a battery - usually 9 or 18V. It is a good alternative to active pickups. Active electronics are designed for usage with standard pickups. You can switch off or on it and the guitar will work active or passive, with or without the battery need.